Click the picture to watch (or re-watch) the End of the Line video. It’s the best thing this entire debacle has to offer. You guys wanna know something? Prior to End of the Line’s recent release, I hadn’t cared much one way or the other about the update for months. The preview version of the map I’d played with some friends didn’t seem particularly interesting, and the Love and War update had ended the weapon drought that made us so greatly anticipate EotL’s arrival in the first place. Yet, despite all of the feelings and expectations I DIDN’T have, the End of the Line update still managed to make me feel complete and utter contempt toward whatever part of Valve is in charge of TF2. For the uninitiated, the whole thing started with a breathtaking trailer for a then-upcoming animation, End of the Line. It garnered enough attention that Valve themselves asked McVinnie and his team to help create an officially-endorsed community update. As time went on, it was said by McVinnie that the focus of the update was to be non-cosmetic items. 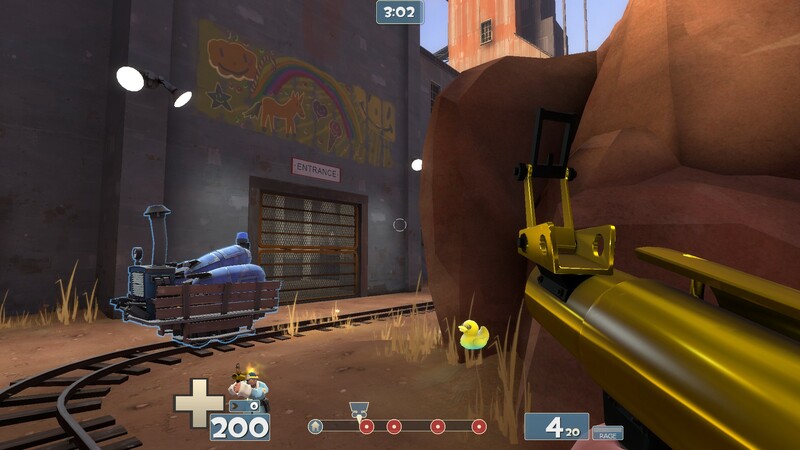 A map and weapons were being developed for the update, the latter of which was cautiously explained to be “not guaranteed”, but it generated a good deal of excitement within the TF2 community regardless (particularly due to the severe lack of new weapons we were experiencing at the time). Throughout the next year, we got small progress updates (most of which I recall being about the map in development, cp_snowplow). The hype died down a bit over time, sometimes flaring back up when people got this or that hunch about the update’s imminent arrival, but otherwise settled in cozily in the back of people’s minds between the occasional information release. As the months went on, we suffered through what was (according to the Wiki) the longest wait for a major update in TF2 history, until finally hitting the Love & War Update, finally giving us the weapons we’d been so desperately asking for (including the B.A.S.E. Jumper, a personal favorite of mine… perhaps I should write about it some time). It was at this point that my overall excitement for the EotL update took its first dip, as the previously-mentioned weapon drought was one of the key factors in making a non-cosmetic update so appealing. Later still, we got our first look at cp_snowplow, which ended up being an Attack/Defend capture point map with a train gimmick. in which capturing a point caused the train to drive up to the next one, with the train slowly taking damage in place of a timer. Again, my anticipation lessened, as the preview version of the map I played (cp_snowplow_b1) simply wasn’t quite what I had hoped for. I wasn’t particularly fond of the layout and had been expecting some take on Payload, rather than A/D. By this point, while I still respected the effort being put into the update and was curious just what the finished product would look like, I had run out of things to be personally excited about. I watched as parts the community continued to speculate the release date at the slightest provocation, myself wondering when we would finally get the update and whether or not people would go home disappointed. My general expectation was that the update would be a somewhat good but overall underwhelming one, perhaps being disappointing to those who’d let their anticipation get the better of them but otherwise being a harmless addition to the game. Instead, what we got was, in my eyes, the biggest insult to both Team Fortress 2’s playerbase and community content creators that I have ever seen. I found it disrespectful to not only everybody who waited for it, but to those who worked on it as well. Valve, without any warning from either them or the community team, gutted the update of everything it was supposed to be. Rather than a unique map and interesting weapons, we got a stock melee reskin, a taunt, and a pile of cosmetics (one of which took 4 extra days to make it into the game). Oh, and for whatever reason, we also got a poorly-explained cash grab of an “event” in which you can pay to keep track of rubber ducks you collect from killed players. Plus they plastered End of the Line advertisements on the maps in the form of posters, graffiti, and a new payload cart. If it’s not already obvious why I completely despise this so-called “update”, let me put it like this. Imagine Team Fortress 2 is a restaurant. Now, imagine said restaurant used to be praised for its exquisite side dishes. These side dishes varied in quality, but we appreciated them regardless because they were free additions to an already splendid meal. They sometimes used corn as filler but were otherwise still decent. More recently, though, the restaurant has ran out of ideas and the side dishes have started to become almost nothing BUT corn, to the point where they’ve started relying on local farmers to provide them with different varieties of it. Plenty of amateur chefs are volunteering to come up with new, substantial side dishes, submitting recipes left and right, but the restaurant continues to rely only on the farmers’ help. After a few too many helpings of corn, we’re grown tired of it, and are starting to crave something a bit. Now imagine that a team of volunteers finally catches Valve’s attention with a bit of dinner theater, and are given the chance to come up with their own recipes to serve alongside it. We all gather in anticipation, curious to see just what they’ll produce. They put their heart into creating wonderful culinary concoctions to go along with their masterpiece, doing their best to meet the supposedly high standards of the restaurant. Sure, it’s still going to include some corn, but that’s not going to be the main course. All of us at the table patiently await, hoping that our meal will be worth the wait, but doing our best to keep our expectations in check. On the odd occasion, we mistake a passing sight as a sign that our food is ready, only to be find out that we still have to wait a bit longer. After quite some time, the guest cooks finally give their creations to the wait staff, who proceed to eat it all. Then, deciding that the food is unfit for us patrons, they walk up to our table, pull down their pants, and excrete the then-digested meal onto our plates, leaving nothing but the corn intact. But wait, we’re not done. They offer to add some (rather rancid) roast duck for an extra charge. Obviously, those of us who have sense get up and leave immediately. Many of us complain openly, going so far as to consider trying out the newer restaurant down the street. Granted, it’s owned by the same company, but it hasn’t been treated nearly as poorly. However, as much as we want to, we can’t forget the experience because the entire affair has had advertisements tastelessly plastered everywhere, and they won’t be taken down for quite some time. We even get one last corn kernel in the mail a few days later. …and that’s exactly what we got. Stop saying I’m a good Medic!